I have recently been writing two reviews for the movies that I have seen in theater. There are a few reasons behind that. First of all, theater films are great, but I have no method of jotting down notes, so my review aren’t as long nor as thorough as I would initially like them to be. Plus it gives me a reason to see some movies that I enjoyed viewing one more time. I’m not going to re-watch movies that I thought were done poorly twice. So let’s get on with the review of “Men in Black III”. Let it be known, that so many people hate, well, the second film in the series if not the whole series. I don’t really understand why. Some people have a biased opinion on Will Smith, but Will is one of my favorite actors. Not because of his acting abilities, mind you, but because he is a fun person, a good man, and someone I grew up watching on TV and Film. So forgive me if I think the man is great at what he does. Don’t be surprised to hear me say this is the third time I’ve watched this movie, twice in the theater (3D & Drive-In), and now the regular DVD/Blu-Ray release. Boris the Animal (Jemaine Clement) is in prison…on the moon. He first is freed by his girlfriend (Nicole Scherzinger), whom he was using just to get set free, and he had a very clear motive once arriving back on earth, kill the man who put him in prison, K (Tommy Lee Jones) …before he puts him in prison. So one night, K disappears from existence, leaving no one to remember him but J (Will Smith). If you are wondering if they explain that, they do. J then travels back in time and joins younger K (Josh Brolin) to find both future Boris and original Boris and stop them both. As with any time travel film, there are going to be some plot holes. For instance, if K never existed, how in the world does J end up being a man in black? It’s not because he was always going to be one, and I can’t exactly explain further, but there could have been only two explanations to this question, and the movie tried both out, creating a paradox. On another part, J walks into the convenient store, pointed a gun at the clerk and said “You helped Boris the Animal travel through time” to which the clerk said “I had to, the guy was a freak”. Um, no, that’s what happened before, in the other timeline, this timeline Boris never went to prison and therefore never needed to travel to the past…yada yada. I won’t discount that too much, because it is terribly difficult to get around paradoxes in time travel movies. In the end, you just have to accept how they did it and get on with your life. I both liked this film for a number of reasons as well as disliked it for totally different reasons. Overall I liked it more than I didn’t. First of all, there is a new villain that is memorable in the way “Men in Black” villains should be. Maybe it is because it has been so long since the previous film, or maybe it is for another reason, but it still felt slightly off as a whole from the other films in the series. It was still good, and a lot of people put it above the second movie, but I might have to put it on par, maybe a couple points ahead for having a fresh story and interesting concept. The comedy in this movie was probably a bit better than the second film, though nothing can touch the original “Men in Black”. With an assortment of time period, sarcastic, and physical humor, this film just kept going. 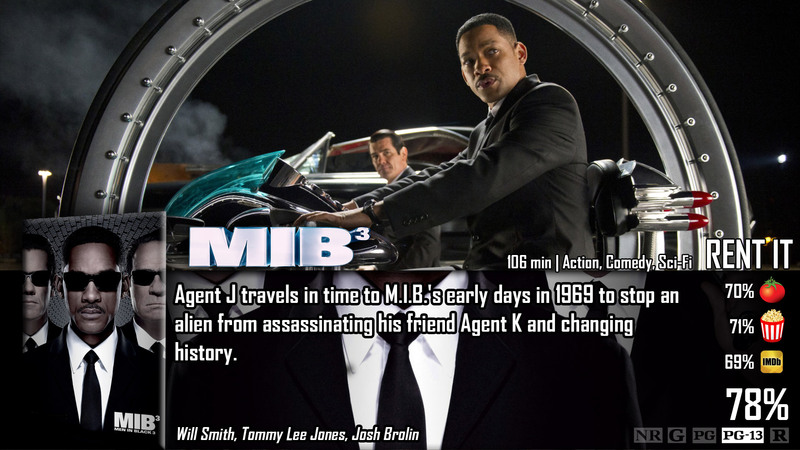 A good majority of what makes this, as well as any other “Men in Black” film, is Will Smith. Yes, he uses inspiration from “The Fresh Prince of Bel Air” most for these movies, but that’s what I love. In a way the whole movie is nostalgic. I felt as if Will jumped right back into character, and he nearly looked identical to when he began. The only bad acting done in the film was from unimportant side characters that were about to die in the next few minutes, so it wasn’t such a bad thing. Tommy Lee Jones looked a lot older and didn’t act the same, didn’t have that same serious, but sarcastically humor side. He instead was a lot more serious, he was given some K jokes, but barely any, as those were reserved for Josh Brolin later on. It was Josh Brolin that took over and benefited where Tommy Lee Jones couldn’t perform, reminding us of what we loved about the first movie when it came to K. Brolin looked the part and executed each of his lines properly. He had all of the elements of K and more, having a lighter view on life. As an audience we know something is bound to happen in the movie that turns K into that cold stern man we all know and love. This was and still is a pretty big deal for me. At the same time, a lot of people would disagree with me and say they did it right for once this time around. Tony Shalhoub and David Cross did not make their cameos this time around. I loved their characters, and most people would like that they didn’t show up, so they could embrace originality. The thing is there were already characters in place towards the beginning of the film that would have fit their characters absolutely perfectly, as if the roles were originally written before being removed. Overall, the storytelling in this film was generally better overall, and it was so great to see the “Men in Black” back in black. They also were able to implement more language to match the moderate use the first film had. You may have noticed there was barely any language in the second film. In the long run, it just would have been nice for the filmmakers to implement a lot more of things that were mentioned in previous movies. K’s first confrontation with Serleena in the past. K giving the “tall man” some flowers as seen in photographs in the first film. The story was developed, just not as far as it could have been. I have to dock points for that. Sidenote: This is the only time in the entire series where the audience is shown that the Men in Black do have homes that they go to at night. It’s nice that they cleared that up. This one is a lot if fun! Josh Brolin stole the stole.